Package of 2 LEDs (8 mm diameter) and chrome-painted plastic mounting bezels. Bezels mount in a 0.5” mounting hole and can be used with a 0.25" maximum panel thickness. 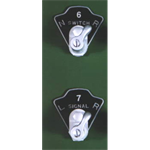 Typically used for the center indicator above a CTC Signal control lever and sometimes used for the Reverse route indicator above a CTC Switch control lever. 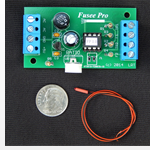 Includes current-limiting resistors for either 5V or 12V DC power sources.